John Savage. 1996. Listening & Caring Skills: A Guide for Groups and Leaders. Nashville: Abingdon Press. Being fully present when listening to someone is tough. It requires setting aside our own egos to hear not only what the person is saying but what is not being said—the backstory. The backstory is important because language is laconic; tone of voice and body language provide the context. 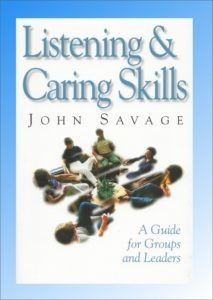 John Savage’s book, Listening and Caring Skills, helps to start down the road of being fully present in listening to your family, friends, and colleagues. Listening and Caring Skills focuses on preparing pastors for ministry, but the principles apply more generally. The book starts with an introduction defining the problem and follows with three major sections: Basic listening skills; hearing the story, and advanced listening skills. Savage starts by defining the listening problem as closing the gap between what is said and what is heard (17). This gap can be huge because the speaker desires to communicate feelings, intentions, attitudes, and thoughts. This internal desire is actually communicated with words, tone of voice, and body language. Words communicate about 7 percent of the message; tone of voice communicates 38 percent; and the remaining 55 percent is communicated through body language (16). Focusing on just the words used in written communication leaves out important information needed in making decisions. Consider the potential for conflict just because of weak communication. Skyping can communicate words, tone of voice, and some body language. Telephone conversation can communicate words and tone voice but no body language. Email communicates only the words—unless you are really good with emoticons! Clearly, if I use a form of communication that is incomplete, the potential to be misunderstood grows in proportion to what is left out. Face-to-face communication at least allows a complete set of details to be communicated. Once we are face to face, communication is technically feasible, but we do not normally engage everyone at the same level. Savage lists five styles of communication: direct and open, open but partial, distorted full information, distort and delete information, and only non-verbal communication (15-16). At best communication is an art: people lie; people don’t listen’; people run off. Being fully present is a gift that we give to those who we really care about. In my experience, people notice immediately when you are really listening. A lesson worth the price of the book is a technique called fogging which is often used by politicians and lawyers. In fogging one only answers the part of the question that one agrees with. The most famous example of fogging occurred in Matthew 22:15-22 when Jesus was baited with the question: is it lawful to pay taxes…? If he answers yes, then the Jews will be offended; if he answers no, then the Romans will be offended. Instead of answering, Jesus asks to see a coin–everyone agrees on the coin used to pay the tax. When one fogs, one does not answer the whole question and does not become defensive—even when the question is hostile. Fogging allows the conversation to continue without becoming emotionally charged. Savage observes that in order for people to feel like they have been heard, you need to identify the emotional content of what they are saying. Oftentimes, this emotional content takes the form of one of five story types that he outlines (95), including. Anniversary. An anniversary is a story connected to a date on the calendar. Perhaps someone important died or had an serious accident on a particular date. In the story of the patient, the date was a birthday. The most famous date at the time of Jesus was the Exodus of the people of Israel from Egypt which they celebrated as Passover each year. A “I know a man who” story. In this case, the person under discussion is normally the person speaking because the subject matter is too sensitive. In the Bible, we read: “I know a man in Christ who fourteen years ago was caught up to the third heaven– whether in the body or out of the body I do not know, God knows.”(2 Cor 12:2)2. A transition story has three parts—the past, the present, and the future. A hospital visit is normally a transition story. University studies are also a transition with three parts. A transition obvious in the Bible is the story of the Exodus when the people of Israel left the land of Egypt, went into the desert for forty years, and afterwards entered the Promised Land (Bridge 2003, 43). It is interesting that the people of Israel learned to depend on God during their time in the desert. A reinvestment story. This is a story like economist becomes pastor. That was then; this is now. In the Bible we see this type of story in the conversion of Paul from a persecutor of the church into an evangelist for Christ. If you can identify the story that a person is telling, chances are good that you will connect with them at a deeper, emotional level. Savage’s Listening & Caring Skills is a book that I have recommended, given away, taught, and preached about. Active listening skills are of value in dealing with your children, difficult co-workers, and demanding supervisors. In the church, pastors can benefit from periodically reviewing Savages principles and teaching them to those in leadership. It is simply a great book.